CICC is glad to present a seminar about Cyberscurity, aimed to inform & lecture about all (potential) dangers that might be encounter in today's online world. Moreover, we would like to also provide tips in order to prevent and secure yourself online. The seminar will take place in Shanghai in the morning of 8th February. 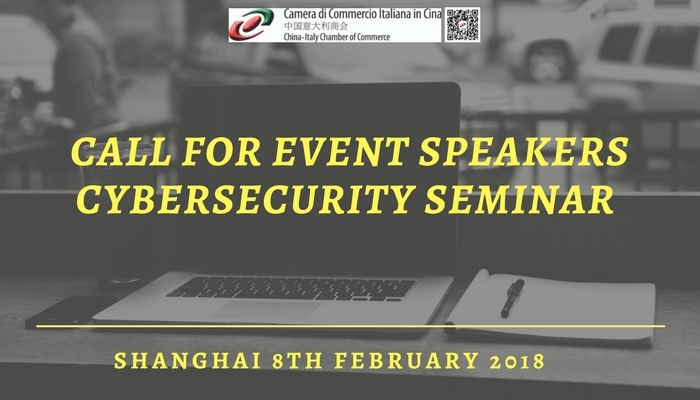 We are looking for top speakers with a long experience, preferably an academic background and a wide and specific knowledge of Cybersecurity issues in China. Please, send us the specific topic you would like to propose together with a presentation and the application form filled. Also, include your CV. The selection of the speaker will be made according to the contents relevant to the seminar. The Chamber will give priority to the members of the Chamber first and will select the first submitted bid that will meet the standards indicated. If no applications are submitted by the members of the Chamber, the Chamber has the right to select the most appropriate application submitted by one of the non-member companies present on the vendor list, giving priority to the “partners” of the Chamber first.